ESPN’s Jon Gruden showered Carson Wentz with superlatives on Monday night’s broadcast, perking up the ears of all of North Dakota with his praise for the former NDSU quarterback. 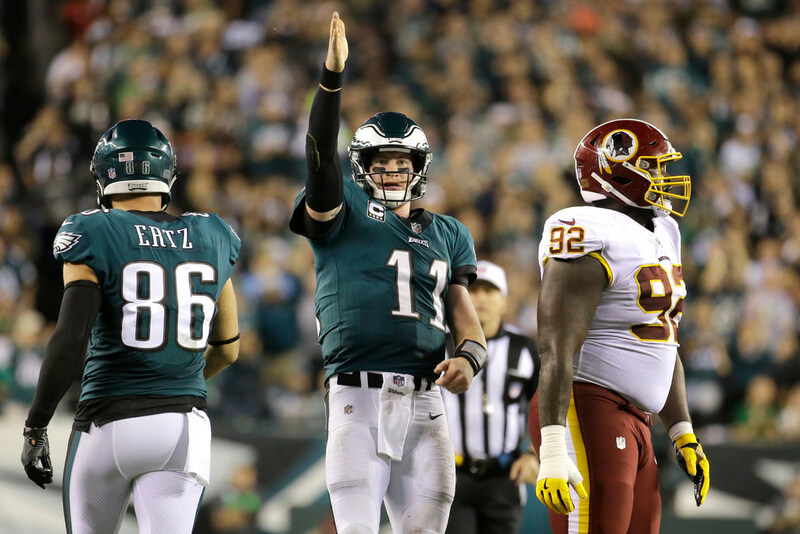 Second-year quarterback Carson Wentz delivered the kind of performance Monday night against Washington that can change perceptions quickly. If you were skeptical of Wentz going in, you had to think twice. If you already liked what you saw from the Eagles quarterback, you might now think he’s on his way to stardom — or already there. Wentz was that good in throwing four touchdown passes, averaging 10.7 yards per pass attempt and running for 63 yards in a 34-24 Philadelphia victory. He made an amazing escape on a scramble that helped extend a drive to seal the game. The Eagles are alone atop the NFL with the best record at 6-1. And Wentz is playing like he’s the best quarterback — or at least the best healthy one — in league. He will need a larger body of work to remove the qualifiers from that claim, but through seven games Wentz has thrown 17 touchdown passes to just four interceptions, along with 1,852 yards passing. Tom Brady and Alex Smith have some better raw numbers, but Brady doesn’t add a running dimension and Smith has a much better supporting cast. Aaron Rodgers is probably better than all of them, but he’s out with a broken collarbone. Wentz is bursting through the door and taking some of that spotlight. His teammates? They have a ton of confidence in Wentz. The Washington Post is examining his MVP candidacy. Bleacher Report’s Doug Farrar at least thinks Wentz is the most dangerous QB in the NFL. I’m also from North Dakota, and I can seen some interesting scenarios developing in the NFC. A lot of people in the state root for the Vikings, who are 5-2 and playing themselves into contention. A lot of people also became Eagles fans the minute Wentz was drafted in 2016. Those two teams have to be at least considered among the 5-6 most likely at this point to represent the NFC in the Super Bowl in February … in Minneapolis. Hey Minneapolis, if the Eagles make the Super Bowl there are going to be 700K NoDaks headed your way. Stock up on Bud Light.